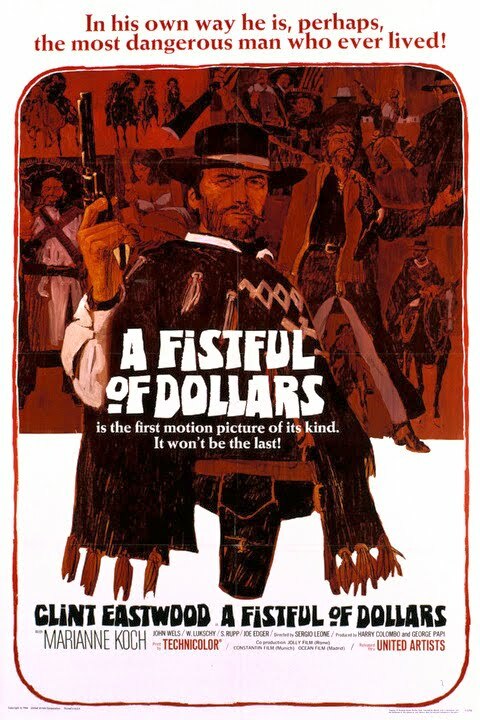 A Fistful of Dollars is a 1964 Spaghetti Western film directed by Sergio Leone and starring Clint Eastwood in his first leading role, alongside Gian Maria Volonte, Marianne Koch, Wolfgang Lukschy, Sieghardt Rupp, Jose Calvo, Antonio Prieto, and Joseph Egger. As few spaghetti westerns had yet been released in the United States, many of the European cast and crew took on American-sounding stage names. These included Leone himself ("Bob Robertson"), Gian Maria Volonte ("Johnny Wels"), and composer Ennio Morricone ("Dan Savio"). A Fistful of Dollars was shot in Spain, mostly near Hoyo de Manzanares close to Madrid, but also (like its two sequels) in the Tabernas Desert and in the Cabo de Gata-Nijar Natural Park, both in Almeria province. The retrospective reception of A Fistful of Dollars has been much more positive, noting it as a hugely influential film in regards to the rejuvenation of the Western genre. 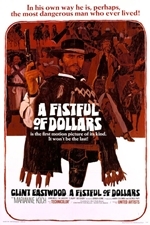 The 67th Cannes Film Festival, held in 2014, celebrated the "50th anniversary of the birth of the Spaghetti Western... by showing A Fistful of Dollars". Quentin Tarantino, prior to hosting the event, in a press-release described the film as "the greatest achievement in the history of Cinema".